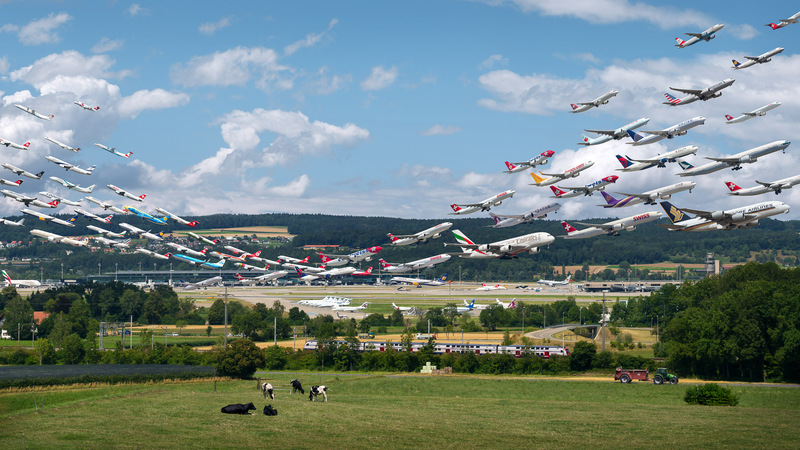 Aircraft take flight from Zurich Airport, Switzerland, in one of Mike Kelley's "Airportraits" images. A couple years back, a composite image showing seven hours of takeoffs at LAX airport went viral. The man behind that image, Mike Kelley, has spent the time since working on expanding his initial idea. The result is Airportraits, a photo series that repeats the trick . From Tokyo's Haneda to London's Heathrow, Kelley sat, stood and occasionally danced while shooting hundreds and thousands of photos of aircraft taking off. He then stitched the images together to create a composite image (a single image comprised of elements from multiple photos) that represents his time at each location. Kelley leaned on his experience as an architectural photographer to build the images. He often uses light painting, blending natural and artificial light to create composite images that cast buildings and interiors in an almost magical light. Where the Airportraits differ from the original viral image is in composition. While the LAX image was impressive, there was no sense of place; it could've been any airport, anywhere. For the new series, Kelley shot from a range of vantage points -- a Sydney shot from a beach, Tokyo from a boat out on the bay, Amsterdam over a meandering river and so on. There are also people, animals, cars and other elements that sell each image as a scene, or a story, more than before. Perhaps my favorite from the series is the image atop this article, taken near Zurich, Switzerland. It depicts eight hours of takeoffs from a pair of runways. Speaking to Resource Magazine, Kelley explained what makes this image so special: "Due to a complicated noise abatement scheme, Zurich Airport actually uses runways oriented in different directions depending on how light or heavy the winds are. This made for a very interesting photo when combined with the idyllic Swiss countryside that surrounds the airport," he said. You can view more of the series on Kelley's site, read more about individual images at Resource Magazine or buy prints in various sizes from his store.